Born at Roblin on 27 December 1913, youngest child of Robert Allen Wright (?-1915) and Janet Whyte, he was educated at Goose Lake School and the Central Normal School (1931-1932). He served as the teaching Principal of Gilbert Plains School (1932-1936), Markham School (1936-1938), Tanner School (1938-1940), and Minitonas School (1940-1944). He earned BA and BEd degrees at summer and evening schools. In October 1940, he married fellow teacher Irma Ruth Van Camp (1915-2006) and they moved to Winnipeg around 1945. 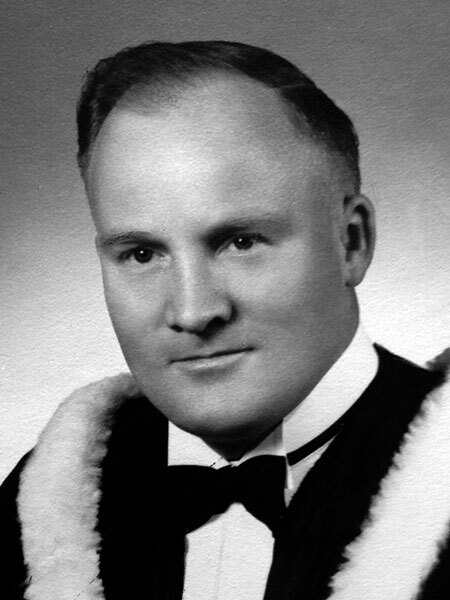 He taught at St. John’s College School (1944-1950), Fort Garry School (1950-1952), Rockwood School (1952-1953), General Wolfe School (1953-1954), and Churchill High School (1955-1961). He returned to the role of Principal at Glenelm School (1961-1966), followed by terms as Vice-Principal of Grant Park High School (1966-?) and Churchill High School (?-1974), after which he retired. He died at Winnipeg on 25 June 1996 and was buried in the St. Vital Cemetery. “Principals and teachers are listed for 1952-53 terms in Winnipeg Schools,” Winnipeg Free Press, 29 August 1952, page 12. “1,765 hired to teach in city,” Winnipeg Free Press, 31 August 1960, page 4. “To honor 3 at Churchill,” Winnipeg Free Press, 24 May 1974, page 5. Obituary, Winnipeg Free Press, 29 June 1996, page 41. Obituary [Irma Ruth Wright], Winnipeg Free Press, 18 February 2006, page 44. This page was prepared by Nathan Kramer and Keven Van Camp.